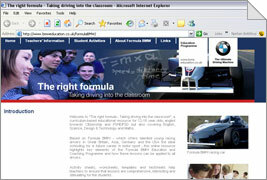 Working under contract to DBDA (dbda.co.uk) to develop a DDA-compliant site to educate children about BMW and their involvement in various key areas such as road safety, clean energy for the future and motorsport. 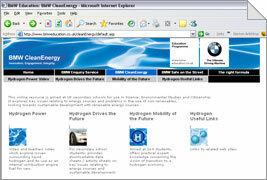 Working alongside DBDA, Macroweb implemented this DDA level 3 compliant website for BMW UK. The complete site, comprising 3 main sections with their own distinct design theme, had to be re-coded in order to comply to Conformance Level "Triple-A" of the W3C's Web Contents Accessibility Guidelines 1.0, yet still maintain the same look and feel as the previous version.